Currently printing in white is an expensive and laborious task using manual printing techniques. 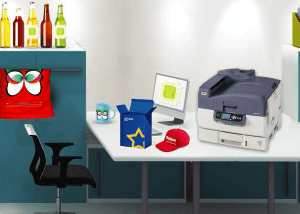 With OKI's ground breaking digital technology, you can now print inhouse using white toner alongside High Definition colour on a wide range of media, including coloured media, clear film and transfer media in sizes up to A3+ and weights up to 300gsm. 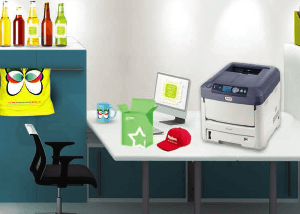 Being able to achieve vibrant full colour printing plus white is an advantage to any graphics business offering short run display materials, bespoke stationery, t-shirts or promotional merchandise. This machine also sports self-weeding technology. The C711WT (White Toner) lets you print in breath- taking colour-plus-white on transfer sheets that can be used with a wide variety of substrates. 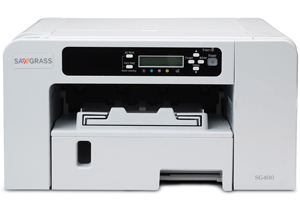 It features enhanced High Definition (HD) Colour Printing and Single Pass Color™ technologies, with a straight-through paper path, for results that ordinarily require expensive manual printing processes. With a colour print speed of up to 8 ppm on transfer media and up to 34 ppm on day-to-day standard media, the C711WT keeps work flowing smoothly. Create like never before with Sawgrass’ Virtuoso Desktop HD Product Decorating Systems featuring the Sawgrass SG400 (Letter, A4) inkjet printer. Virtuoso is the industry’s first and only fully integrated desktop system designed specifically for sublimation. Imagine brighter, higher-definition images, with unsurpassed ease-of-use, support AND lower start-up and imaging costs. Virtuoso delivers all this and more, taking the art of digital printing to its next evolution.